Saturdays are usually a day for a casual lunch. 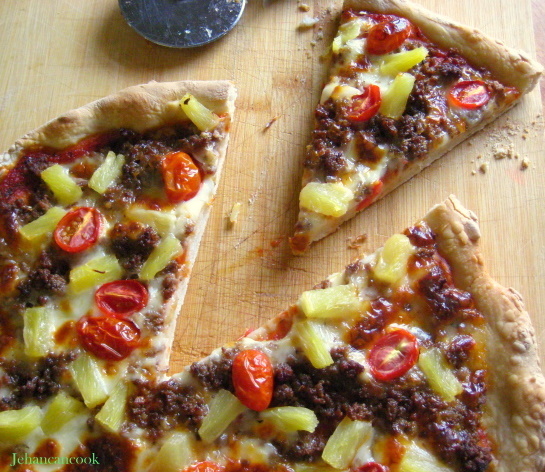 Today I decided to make a family favorite, beef and pineapple pizza. I’m a lover of beef and all things tropical so this works for me. Being that I was born in a tropical climate I’m naturally biased when it comes to anything with tropical flavors(pineapple, coconut, mangoes), so pineapple on my pizza is the absolute best topping. One of the things I love about pizza, besides being yummy or cheesey, is the fact that you can top it with whatever you like. When I decided upon pizza for lunch I realized I needed find a great crust. In the past I’ve tried recipes that came out tasting too “yeasty”. I searched online and wasn’t satified so I turned to my collection of cookbooks and I came across my The Best of Gourmet cookbook and they had this great pizza crust recipe. I decided to try it and was pleased, in my opinion this is great pizza crust. I’m no Italian mama so I didn’t have a pizza stone or a brick oven, so I made my on a round pizza pan in mine oven and the results were great. Enjoy!! To make dough stir together yeast, 1 tbsp flour and 1/4 cup warm water and let stand until it foams, about 5 minutes. If the mixture doesn’t foam, discard and use fresh yeast. Stir 1 1/4 cup flour and salt in a large bowl. Add yeast mixture, oil and 1/2 cup warm water and stir until smooth. Add remaining flour and stir together. This dough will be wetter than other pizza doughs. Knead dough on a lightly floured surface until smooth and elastic, about 8 mins. Lightly flour hands to prevent sticking while kneading. Place in a bowl, cover with a towel and allow to double, about 1 1/2 hour. Preheat oven to 400 degrees. To make crust, don’t roll the dough, stretch the dough with your hands until the dough forms a 14 inch circle. To make topping, mix ground beef, Italian seasoning, crushed garlic, salt and pepper together. Brown meat in 1 tbsp of olive oil. Stir meat to break up into smaller pieces. Spread spaghetti sauce over the top of the pizza dough leaving a 1 inch border. 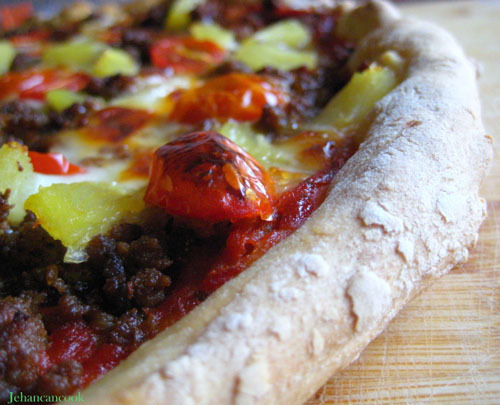 Spread mozzarella cheese over the spaghetti sauce, then sprinkle ground meat, pineapple and grape tomatoes. Bake until golden brown and cheese is bubbling about 15 to 20 mins. I don’t have a recipe for the white fudge. Sorry. Anyone who loves a Hawaiian (ham and pineapple) will probably give your twist a try. I love the cherry/grape tomatoes, am thinking heirloom would be even better. This looks delicious! 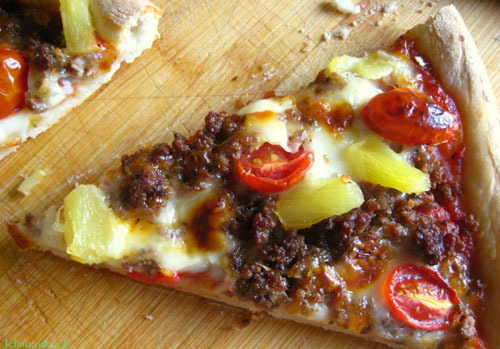 I’ll have to add this to our topping rotation for our weekly Friday night pizza. The pizza crust I make is very similar to yours, with the exception that I substitute a small amount of whole-wheat flour for the AP flour, and I add 1 tsp of honey or sugar to the yeast/water combo to feed the yeast. I am going to try this with textured soy protein. I cannot help the picture calling me. I am all about the tropical flavours. I would like you to dosome dessert style pancakes. Cristal I don’t not have a recipe for cornbread or rice cake.